Freshly printed materials are usually not ready to be used right away. They may need to be bound into a brochure first, or cut to the right size. The final processing of the materials provides the finishing touch that gives the final product that little something extra. We do all final processing in-house, using various techniques. Cutting is often both the first and last stage in the finishing process. 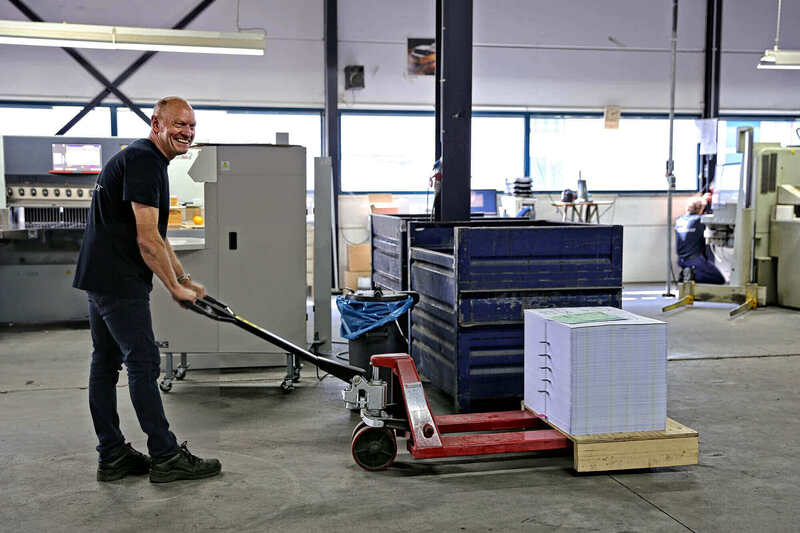 As printed materials are often printed on larger sheets of paper, we start with preliminary cutting during the first stage of the finishing process (pre-cutting). We then treat the materials with a (spot) uv coating, gloss or lamination if desired. Once all additional processes have been completed, the materials are then cut to the desired final size. If desired, we can fold your materials to the desired final size manually or mechanically. Here are some examples of folding techniques we are equipped at using: cross fold, roll fold, 3-panel fold, concertina fold, and folds with 1 or multiple turns. Our various types of scoring machines enable us to score cards, invites, folders, brochures and the like. Beading is required for paper with a weight of 150 grams and up that then needs to be folded. It helps ensure a neat fold later on. Perforating allows you to add a perforated line to your materials, making it easy for people to tear off a particular section. This technique is used to manufacture sets, giro transfer slips, coupons, and admission tickets, among other things. Punching enables us to add all sorts of cut shapes to the printed materials; circles, rounded corners, or other original shapes that will add even more emphasis to your message! Slitting refers to the partial punching of materials, i.e. cutting the top layer halfway down to the paper carrier. This technique is used for sticker sheets, among other things, making it easy for people to remove stickers from the sheets. Embossing enables us to add a luxurious touch to printed materials. We use a great deal of pressure to press a particular stamp into the paper, causing it to be permanently marked with the stamp design. Blind embossing is used to add safety features to printed materials such as tickets or diplomas. By glueing sheets of paper together, we can create blocks. We can also do this with sets, creating coloured copy paper). These blocks or sets can then be equipped with a cardboard backing or (printed) elongated bottom board. Drilling one or multiple holes in the paper, such as to enable storage in binders. 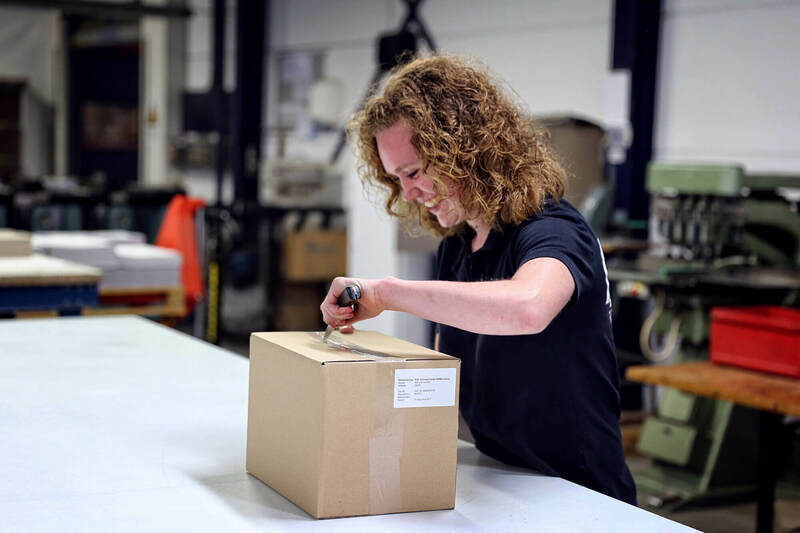 Printed products are equipped with a drilled hole including a metal ring and an (elastic) cord. Creating materials such as brochures by way of staples along the spine, at the top left corner, or double binding. UV spot coating adds a shiny layer to the material, making products stand out more and come to life. Lamination adds a more luxurious feel and increases the lifespan of materials. It makes them more durable and keeps them from tearing in due time. There is a wide range of lamination options, but matte, glossy, and soft-touch lamination are the most common ones. We first stretch the laminate across the printed material and then cut it to the right size. Plastification refers to encasing printed materials in a plastic cover, which results in a transparent rim on all sides. We can apply this technique for the following sizes: A7, A6, A5, A4 and A3. Foil printing utilises a special printing technique. Brass stamps and a temperature of around 130 degrees are used to add foils in a wide range of colours to the printed material. This technique is perfect for chic invites, unique Christmas cards, certificates or diplomas!